What a gorgeous day at the pool! The weather couldn't have been better and about 600 people turned up. There was music and dancing, fun on the inflatable pool thingy, bouncing in the bouncing castle and sausages a sizzling. Not to mention our beautiful pool and the grass and shady trees that surround it. It's impossible for photos to capture just how awesome this day was but you get the idea! If anyone else has any photos they'd like to share, we now have a fledgling flickr group or you can email them to me at janetmgrigg@gmail.com. 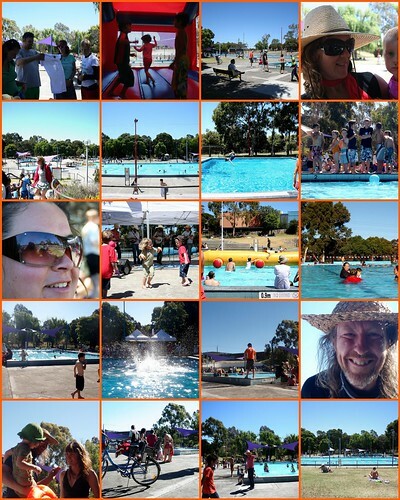 1. t-shirts were in demand, 2. jumping castle, 3. learn to swim pool, 4. robin and sunny, 5. from the entrance, 6. from the terrace looking down to the big pool, 7. diving board in action, 8. lining up for the inflatable, 9. mel watching Newland Creak, 10. merri, sunny and some other children dancing to Newland Creak, 11. watching kids on the inflatable, 12. relaxing at the end of the day, 13. learn to swim pool, 14. splash into the diving pool, 15. lifeguard at learn to swim pool, 16. andy, 17. talking by the pool, 18. bike, 19. nick waves for the camera, 20. looking over the big pool Created with fd's Flickr Toys. "18th Jan 2008, band a playin', bikes in the distance. The surrounding green like nowhere else I know in this town. Kids breakdancing to the band that's by no means hip hop. But it's community, it's diversity, it's adding to the colour of our moods. On this sunday, on this sunday."